The Tennessee Titans defeated the Philadelphia Eagles, 26-23, in Week 4 of NFL action. Quarterback Marcus Mariota had a great performance coming back from injury. Mariota managed the pocket well under pressure, making mostly good decisions with the football, finding the open receiver and hitting some tight windows. Mariota also made some plays with his legs, both by design and off of the scramble, including a clutch scramble where he picked up 15 yards on a long third down situation to give Tennessee a much more manageable fourth down play as they made their overtime charge. Corey Davis was certainly happy to see Mariota return, as the second-year receiver had himself a career game against the Eagles. The former first-round pick worked and profited over the middle of the field all afternoon, routinely finding himself open on crossing routes. His highlight in regulation was a 51-yard post route where he turned on the burners to beat Jalen Mills downfield, and then he one-upped himself by securing the game-winning touchdown in overtime. The Titans brought a lot of different pressure packages which sprung a couple unblocked pressures, including a Malcolm Butler sack. Interior defensive linemen Jurrell Casey and DaQuan Jones caused quite a bit of havoc rushing the passer and both were strong against the run. Rookie edge defender Harold Landry had a momentum-changing strip sack in which he beat right tackle Lane Johnson to the outside. Rookie linebacker Rashaan Evans looked a bit lost at times in coverage, allowing tight end Zach Ertz to do some damage in the middle of the field. Malcolm Butler also had his struggles in coverage, allowing multiple first downs as well as being involved in the bust in coverage where Jordan Matthews broke free for a long score. The Titans held the Eagles screen game in check, in particular, a couple nice reads where the Titans edge defenders diagnosed the play and peeled off to make the stop. Quarterback Carson Wentz is starting to look like himself, as he displayed some nice throws and escapability in the pocket against the Titans. For the most part, Wentz made good decisions all day and played relatively mistake-free until a poorly thrown dropped interception in overtime. Guards Stefen Wisniewski and Brandon Brooks struggled handling interior pressure, giving up multiple hits each. The Eagles’ receivers had quite a few drops, including three by Nelson Agholor. Tight end Zach Ertz was effective at exploiting the middle of the field, consistently finding holes in the zones between the Titans’ young linebackers. The Eagles ran some trademark RPOs and got some easy completions for first downs as well. The Eagles secondary had a tough time keeping up with Titans receivers crossing the field. Tennesse mixed in lots of play action with horizontal crossing routes, of which put Eagles defenders in situations where they were matched up one-on-one having to chase players across the field. All told, it was a down game for the Eagles secondary, but one player who did stand out positively was safety Malcolm Jenkins. Jenkins didn’t have a perfect game (his defensive holding in the end zone in overtime jumps to mind) but he did make a couple of stops in run defense and was able to break up a pass in overtime. The Eagles defense as a whole had a tough afternoon tackling, missing at least 10 tackles in this one. Titans running back Dion Lewis’ ability to make defenders miss allowed the Titans to turn some short passes into chunk gains, helping Tennessee sustain some drives in the second half and overtime. Marcus Mariota looked tremendous coming back from injury. His accuracy and ability to work around the Eagles pass rush led the Titans in a decisive overtime win. 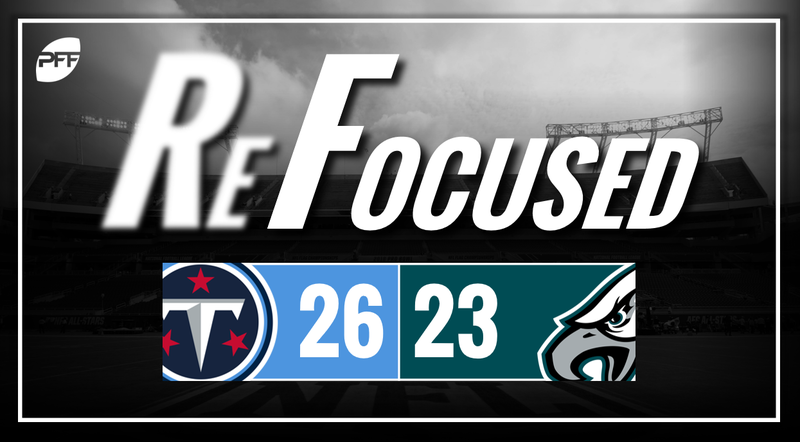 The Titans were timely with their pass rush, generating pressure on key plays which helped them get off the field and force the Eagles to settle for field goals.